Barbara was an amazing hostess and her background in hospitality shows in every detail of the rental and her dealings with customers. The appartment was in an incredible location. My fiance and I were in Manhattan Beach for a getaway and our wedding. We chose Manhattan Beach beacause it was close to the airport but had nice beaches. I am from Monterey, California and my expierences with LA have been horrible. However, Manhattan Beach changed all of that and we will be returning! The rental was spacious, well stocked, very clean, and felt like home. The shower was incredible. I know it's an outdated shower head, but it felt so good to have water presure that could actually get the sand out of your hair. The kitchen was fitted with everything you needed, plus a few more and a bonus of having a gas range! The furnishings are very comfortable and well maintained. The master bed, being a Tempur-Pedic, was just what the doctor ordered. My husband did like memory foam and was worried that it would be far too soft, but he loved it. It was the perfect combo of soft and firm. We slept VERY well! There are sand toys, books, and games for kids if you have them with you. There were even beach bags and an ice chest for picnics on the beach. You really could not ask for more. The appartment is great, the location is perfect and best thing about it... no tourists. This is a locals only kinda spot. We loved it. It was the perfect place to have our wedding and honeymoon! We will be returning and hopefully soon! Thank you so much for your comments. So glad you also had absolutely perfect weather for your wedding on the pier, and the place is so convenient to everything, no need for a car really. Would love to have you back, best wishes to you as well! 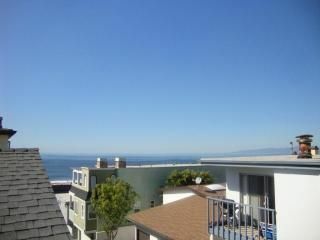 I rented this house and the location in Manhattan Beach was great! The place came with everything I could have wanted. It was clean, everything worked, had an ocean view from the balcony, and the bed was extremely comfortable. With the twin beds in the second bedroom it would be ideal for a small family at a great price for this area. Also Barbara was very easy to work with which was much appreciated! I stayed in this beachhouse for 5 days and found it to be ideal. It was clean, modern, had a sea view and was located only 4 short blocks to manhattan beach boulevard where are the shops, bars and restaurants were. The bed in the main room was very comfortable. Both the main bedroom and the main room had satellite TV. The WiFi worked very well also. There was a small balcony with chairs and a working BBQ. The kitchen had everything we needed - coffee machine, gas cooker, fridge, microwave. The owner was also close by to help out with any difficulties. The only negative was the lack of washing machine. Overall though I would thoroughly recommend this property and the manhattan beach area. This property has the best location to the beach and downtown, along with a comfortable clean and modern enviroment. Cant be beat for the price and location! We strive on" Comfort is our motto"
Golf, surfing, swimming, fitness centers, spas, shopping, sailing, biking, rollerblading, cinema,movie comedy shops, sightseeing, boating, basketball, tennis courts, live theater, Universal City, Disneyland, Knottsberry Farm, Magic Mountain.